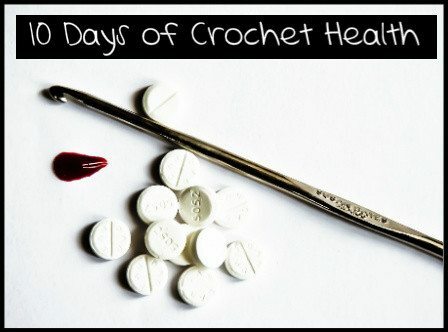 This post is part of a ten day series of posts on the healing benefits of crochet that I’m doing to celebrate the release of my new book, Crochet Saved My Life. Earlier today I wrote about the benefits of crochet in both individual and group therapy. I thought I’d expand on that by talking about a concept I came across while researching my book. It’s about craft in therapy as compared to craft as therapy. These are terms that I found in an article by Sinnikka Pollanen, Ph.D. titled Craft as Context in Therapeutic Change. Basically, it talks about how craft can be used within therapy to facilitate the therapeutic process but can also be a form of therapy itself. Today’s earlier article talked about the role of crochet in therapy where the craft itself isn’t the emphasis so much as it is a tool to reach the other goals of therapy. 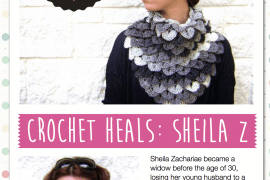 For an example, let’s actually go back to yesterday’s article on the benefits of crochet for pregnancy problems. You’ll remember that I wrote about a group of women who were on pre-labor bedrest at a hospital who got together on the ward to knit and crochet. This isn’t a formal therapy group but it served the function of group therapy or a support group in that the women helped each other in dealing with their unique shared situation of anxiety around high risk pregnancies. In a case like this, crochet isn’t really the therapy. The therapy is sitting there and talking to one another. The therapy is acknowledging and sharing feelings of fear. The therapy is seeing other people who are in the same situation as you. The therapy is offering support to each other within the group. But the crochet serves as a tool to make that therapy process more likely to be successful. It creates a common neutral topic for the women to discuss to make them more comfortable before they delve into their fears. It creates relaxation and camaraderie to facilitate to the rest of the therapeutic process. 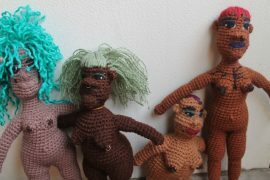 When we see crochet used in therapy sessions in places like hospitals or substance abuse treatment centers it is usually used in the “craft in therapy” model described above. But there are cases where the crochet itself can be the therapy. This is especially true in therapy sessions where the treatment plan includes skill-building. So let’s say that you are a harried mother of four who has struggled with depression and low self-esteem for a long time. You know that you need to find some ways to put yourself first even though you are caring for a large family. You know that you need to do something that will make you feel valuable as an individual person and not just as a wife or mom. You may crochet in therapy or as homework outside of therapy to accomplish this, learning to set aside time each day to practice your craft for the pure joy of it and to build your self-esteem as you begin to increasingly identify as a skilled crafter. While in therapy, you may just talk about the situation, so this is not “craft in therapy” but instead when you go home and practice those skills you are using “craft as therapy”. Which do you think you need more in your life right now – crochet in therapy or crochet as therapy? Crochet is definitely an important part of my therapy… In a way, it’s my chance to sit down and indulge myself in “doing nothing” for 30 minutes or an hour in a day. I get so wrapped up in getting work done that if I didn’t stop and craft, I would never get a break. Crocheting helps me unwind, refocus, and remind myself that yes, I do deserve some downtime, too! @BitterSweet Yes yes yes! It can be all too easy to be “too busy” to take care of ourselves – but of course if we don’t take care of ourselves then we eventually crash emotionally and then we can’t take care of anything! I’m your stereotypical mother (of 3) struggling with depression and low self esteem. While I get your point about crochet as therapy, it doesn’t quite work for me as none of the people around me appreciate or value the things I make, seeing it as a waste of time, partly because I don’t use it to earn money. So I share what I make online, but every time I start something new, it’s back to scratch as far as any benefit to my self esteem is concerned. So I’m still working on it and hoping to start therapy in the autumn. I am so sorry to hear that those around you don’t appreciate what you make. Sadly, this is something that I have heard all too often. One solution, as you’ve mentioned, is to share what you make online. The online crochet community is terrific and can be a wonderfully supportive place when other spots are not. I would also encourage you to look for a local craft group if one exists in your area because that’s another place where you can crochet in a supportive environment. And also, hard though it may be, try to appreciate every single thing that you make. It’s a work of art that has come out of your own hands and there’s something magical and wonderful about that! I do hope that you are able to start therapy. I know that I found it immensely helpful in my own life. Feel free to reach out if you need to. @fugitive247 Thanks so much for you positive feedback. I wish you all the best in your continued recovery!